Dr. Zhang obtained his MD with highest honor in 1983 and PhD in Toxicology and Occupational Epidemiology in 1988, from Shanghai Medical University (now Fudan University Shanghai Medical College), China. He completed his post-doctoral/clinical pharmacology fellowship at University of Alabama School of Medicine (UAB) between 1989 and 1992 and then joined UAB faculty in 1992 and moved through the ranks to Tenured Professor and Cancer Pharmacology Laboratory Director. In July 2010, he joined TTUHSC School of Pharmacy as Tenured Professor and Chair. 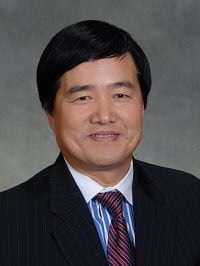 With over 25 years of experience in the field of translational biomedical research, particularly in the area of translational medicine, cancer therapy and prevention, clinical pharmacology and therapeutics, pharmaceutical and toxicological research, Dr. Zhang’s research has been continuously funded by NIH, DoD, and other agencies.Dr. Zhang is a certified toxicologist by the American Board of Toxicology (D.A.B.T.) and served on Board of Directors of ABT between 2009 and 2013. He has been an FDA advisory committee member since 2003 and served as a study section member for NIH, DoD, CDC, FDA, and NIOSH and other international panels. With over 25 years of experience in the field of translational biomedical research, particularly in the area of translational medicine, cancer therapy and prevention, clinical pharmacology and therapeutics, pharmaceutical and toxicological research. 1. Zhang R, Zhang R-W, Jiang X, Wang Y, Chao X, Wu Y. The background values of chlordimeform and its metabolites in urine of general population. Occup Med 1985; 12(4): 7-9. 2. Chen Z, Zhang R, Qiu J, Pan Z. Effects of occupational lead exposure on workers' health. Chin J Prevent Med 1985; 9(4): 216-219. 3. Zhang R-W, Zhu G, Liu Z, Yang Y, Qiu J, Sheng Y, Zhang R. Spectrophotometric determination of air lead with tetra-(p-trimethylammoniumphenyl) porphyin. J Labor Med 1985; 2(1): 61-63. 4. Zhu G, Zhang R, Yang Y, Zhang R, Sheng Y, Qiu J, Liu Z. Spectrophotometric determination of urinary lead with tetra-(p-trimethylammoniumphenyl) porphyin. J Labor Med 1985; 2(2): 79-82. 5. Tao X, Sun Y, Wang M, Xue S, Zhang R, Jiang X, Wang Y. The investigation of health effects on workers exposed to chlordimeform. Chin J Ind Hyg Occup Dis 1985; 3(5): 272-274. 6. Li F, Zhang R, Jiang X, Xue S, Wang Y. Overview on the carcinogenicity, mutation, and teratogenicity of chlordimeform. Occup Med 1985; 12(3): 39-42. 7. Xue S, Zhang R. Overview on sister chromatid exchanges (SCE) as a monitoring index for occupational exposure to chemicals. J Labor Med 1985; 2(2): 66-71. 8. Zhang R, Xue S, Wang Y. Measurement of pesticide contamination on body surface of sprayers through regional and proportional sampling strategy. Occup Med 1986; 13(3): 2-4. 9. Lin W, Zhang R, Gu Z, Wang X, Zhang R-W, Jiang X, Xue S, Wang Y. Urinary chlordimeform and its metabolites as a monitoring index for occupational exposure to chlordimeform. Occup Hlth Railroad 1986; 1: 14-17. 10. Zhang R, Lin W, Wang X, Gu Z, Qiu J, Xue S, Wang Y. Health effects of chlordimeform in exposed sprayers. Chin J Prevent Med 1986; 20(3): 186-187. 11. Wang X, Zhang R, Gu Z, Lin W, Xue S. Occupational chlordimeform poisoning: Case report. J Labour Med 1986; 3(2): 9-11. 12. Chen Z, Fi H, Zhang R, Qiu J, Pan Z. The study of zinc protoporphyrin as a screening index for occupational hazards of lead. Natl Med J China 1986; 66(8): 484-487. 13. Pan Z, Qiu J, Zhang R, Chen Z, Gu J, Xue S, Wang Y. The study of blood lead and free protoporphyrin as screening indices of occupational exposure to lead, an example of application of discriminant analysis. Chin J Ind Hyg Occup Dis 1986; 4(3): 144-147. 14. Wang M, Zhou Z, Li H, Zhang R, Xue S. Risk assessment of occupational exposure to chlordimeform. Chin J Ind Hyg Occup Dis 1987; 5(1): 50-53. 15. Zhu Q, Liu L, Zhang R, Wang Y. Overview on the heme biosynthetic pathway and hemoprotein as indicator of exposure to toxic agents. Intl Med (Pub Hlth) 1988; 2: 65-69. 16. Zhang R, Wang Y, Zhang R, Li H, Jiang X. Urinary formic acid in employees exposed to formaldehyde. Occup Med 1988; 15(5): 55-57. 17. Zhang R, Wang Y, Li H, Jiang X. Monitoring of urinary formic acid in formaldehyde exposed workers. Railway Occup Safety Hlth Environ Protect 1988; 4: 50-53. 18. Zhang R, Jiang X. Hepatotoxicity of formaldehyde. J Hlth Toxicol 1988; 3(2): 18-22. 19. Zhang R, Li H, Zhang RW, Jiang X. Study of the applicability of urinary formic acid as a biological monitoring indicator for formaldehyde exposure. In: Xue S and Liang Y (eds): Occupational Health in Industrialization and Modernization, Shanghai Medical University Press, 1988: pp. 128-131. 20. Zhang R, Jiang X. A preliminary report on the analysis of malignant mortality among faculty members and staff in departments of anatomy of medical schools in Shanghai. In: Xue S and Liang Y (eds): Occupational Health in Industrialization and Modernization, Shanghai Medical University Press, 1988: pp. 89-90. 21. Jiang X, Zhang R. The studies on potential risk of occupational exposure to formaldehyde. In: Xue S and Liang Y (eds): Occupational Health in Industrialization and Modernization, Shanghai Medical University Press, 1988; pp. 70-74. 22 Xue S, Wang M, Jiang X, Li F, Zhang R, Zhou Z, Gu X. Risk assessment of Occupational exposure to chlordimeform. In: Xue S and Liang Y (eds): Occupational Health in Industrialization and Modernization, Shanghai Medical University Press, 1988; pp. 34-36. 23. Wang Y, Zhang R, Jiang X. Inhalation of formaldehyde: toxicology, epidemiology, and control. Occup Med 1989; 16(2): 40-44. 24. Yu J, Qiu J, Zhang R, Xue S. The determination of serum monoamine oxidase activity and its application in exposure assessing for chlordimeform. Chin J Ind Hyg Occup Dis 1989; 7(2): 10-12. 25. Jiang X, Zhang R. Survival effects in cross-section study. J Labour Med 1989; 6(1): 1-4.